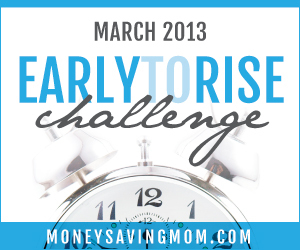 This is Day 8 of the Money Saving Mom Early to Rise Challenge! Today's day talked about creating, art and "shipping". Anything we create is art and for today's challenge, I need to have a plan to create something. Being creative can come easily for me at times. Other times, creative is the last thing my mind is. When I was considering what I could be creative with and ship at the same time, only one thing fulfilled all the requirements: This blog! So, I welcome you to my creative space! One where I'll learn to write better, and will not only be filled with my words, but also memories of these times, this space our family is in. 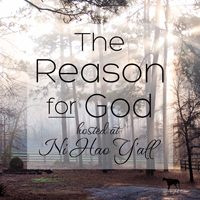 We do have some major things happening behind the scenes. Soon I'll be able to let you in on what's going on! Grab a cuppa joe, come on in , and sit a while! What time did I wake up? Not quite as good as the past few days, but I'll take it! We were up late last night getting some areas cleaned up in the house. D-baby's 1 year birthday was recent, but we're just now getting around to having a birthday party for him. We're trying to get things ready pretty quickly as we're also traveling to Georgia 2 days after the party! Fun, exciting, busy times in our house! What are you creating, planning to create, or shipping?